Perhaps the most common approach to enhancing the security of computers and similar items in schools has been to stencil a mark (usually the school name and postcode) on the computer. The theory is simple - thieves are less likely to steal an item that has the owner's name etched on the casting. Opportunist thieves (including ex-pupils) recognise that it is hard to sell on a product that is so obviously stolen. Unfortunately, developments in the way in which computers are built have meant that this system no longer works on many new machines. The problem is that the traditional system of etching uses a compound which eats into the surface of the computer casing. But modern plastics and the silver surfaces used on newer electronic equipment will not always accept this approach. The new surfaces have the benefit of being very resistant to scratches and with security etching the problem is that they are also highly resistant that traditional methods won't work. During the summer break, I was given details of one solution to this problem that rather impressed me: the ID Silver Mark security marking system. The technical details are that it is a stencil made from an industrial Acrylate material with strong adhesive properties which once put onto a computer casing can only be removed in tiny bits. It also has the added benefit of being able to withstand attack by other chemicals and high temperatures - which means it deters both the opportunistic thief and the professional gang moving from site to site. In the unlikely event of a thief managing to remove any of the stencils, the machine is still protected as the school name will glow visible when viewed under a UV lamp as used by the police to identify stolen property. 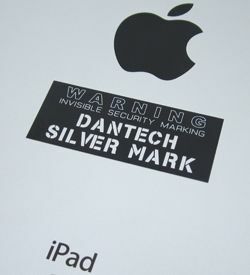 Dantech Ltd is an acknowledged asset and security marking supplier for more than 15 years to both industry, government departments and the educational and health sector providing both security labels and asset labels. With a high reputation built over the years on customer satisfaction Dantech can provide help and advice with your security marking requirements contact Dantech on 01354 688 488.